Fascia is the fabric of the body. It is a three dimensional sweater of fibers, mostly collagen, that surrounds and interconnects all muscle cells, blood vessels, nerves, and all other tissues in the body. It connects the body from head to toe and from front to back in a continuous web of interaction. To the right is an image of living fascia at 25 X magnification taken with an endoscopic camera by Dr. J. C. Guimberteau. Note: Fascia does not normally have air in between the fibers. This is only because of the interruption of the tissues by surgery and the presence of the scope. Normally the space is a continuum of fluid filled compartments. In muscles, fascia surrounds individual muscle fibers, and then again to create groupings of related muscle fibers, and then surrounds the entirety of the muscle belly. You can see an outermost layer of this fascia when you see the smooth and shiny layer of tissue on the outside of a raw chicken breast. At the end of the muscle fibers the layers of fascia come together to feed into and become the white tendon that attaches a muscle to a bone. The collagen based fabric of the fascia continues from the tendon into a layer of fascia that surrounds the bones and then on into the structure of the bone itself. Bone is little more than highly structured layers of collagen fibers in-filled with deposits of calcium and other minerals. The fascial part of the bone creates tensile strength and the mineral content gives the bone rigidity and hardness. The density and arrangement of fibers in fascia change from one part of the body to another. There are areas of thick and dense fascia like in tendons, ligaments, and aponeuroses that allow for more structural support to handle larger forces during movement. In other areas, like around fat cells, fascia has a more sparse and open structure. We gain our ability to move by muscle fibers contracting and pulling on our fascia to move our body. As we move, fascia rearranges itself both by layers of tissue sliding past one another and also by the fibrous structure within tissues re-aligning to allow the tissue itself to change shape. 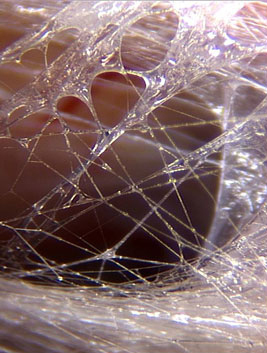 Problems begin when fascia is injured, whether by direct trauma, repetitive stress, or surgery. Injury often causes the formation of scar tissue that can tie layers of tissue together. This can cause pulling and pain during movement. Fascia has to be well hydrated to allow its fibers to move and rearrange. There is a grease around the fibers called the ground substance. This ground substance is, at its simplest, a mixture of proteins and water. When these proteins are well hydrated (have enough water) they form a slippery grease that allows the fibers to move and rearrange easily. With injury, and resulting inflammation, the ground substance becomes dehydrated, becoming more of a glue than a grease. When the fascia gets dehydrated, it can no longer easily rearrange during movement. This injured tissue tends to dehydrate further over time. As fascia dehydrates the tissue retracts creating a pulling and tensing in the local structures and adding pressure into the structure of the body. Read “How Does Myofascial Release Work?” to learn how fascial restrictions can be effectively treated.